Since Spring starts this month, we’re inspired to celebrate the new season with you by hosting a colorful and cheery giveaway! When we think of Spring, we imagine colorful flowers, sunny days spent frolicking on the beach and having fun vacationing in a tropical destination. To celebrate the month of March, Inspirations & Celebrations presents the “Blooming Beauty Spring Giveaway”. The winner of the Blooming Beauty Spring Giveaway will receive a prize package (valued at appx. $500) including the exclusive Pixi Fresh Favourites Set (with Pixi Skintreats Rose Caviar Essence, Pixi Skintreats Rose Flash Balm, and 5 Pixi by Petra MatteLast Liquid Lip glosses), Sephora Cosmetics Lip Crayon in Polar Pink, Models Own Cosmetics Sculpt & Glow Highlighter Stick in Moonlight, Macaron for Hair Detangling Brush & Compact Mirror by Milk + Sass, City Colour Cosmetics Shimmer Shadow in It’s A Girl, Hard Candy Be Bold Glitter Mascara, ipsy Silver Cosmetic Bag, Asea Renu28 Skincare Set (with 2 Revitalizing Redox Gels, a Gentle Refining Cleanser, an Ultra Replenishing Moisturizer, and an Intensive Redox Serum), Hair La Vie Revitalize Shampoo & Restore Conditioner, NYX Cosmetics FauxBlacks Eye Liner, Crabtree & Evelyn LaSource Hydra Marine Nourishing Oil, 100% Pure Bath & Body Sponge, Feel Brilliant Bamboo Charcoal Facial Sheet Masks, Curel Hydratherapy Lotion, PurAttitude PUR Firm celluFIRM lotion, ArtNaturals Sea Salt Volumizing Spray, Bobbi Brown Beauty paperback book, a Sparkly Blush Brush, a Floral Journal, a Jetsetter Passport Cover and Luggage Tag. The Blooming Beauty Spring Giveaway runs from March 1 – March 31, 2018. To enter, follow the easy instructions listed in the Gleam-powered giveaway widget shown below. A random winner will be chosen on April 1, 2018, and contacted via email. The winner must reply by email within 3 days by providing their mailing address and contact information. Failure to reply within this time period will result in automatic forfeiture of the prize. In that situation, another random winner will be chosen. NOTE: We pay for shipping the prize package to the winner, but customs fees & duties may apply (in which case, the winner is responsible for paying these fees). This pertains to non-USA residents. I would love to try these skin care products, winter has left my skin very dull & dry. The Asea Renu28 Skincare Set looks like the perfect remedy to repair it. Would love to try the skin care kit! I would love to win this giveaway as it is the perfect mixture of cosmetics, skincare and miscellaneous items. I’m in my early 20’s and a young mother so this would be amazing for my skin and pampering all at the same time. The items I’m most excited for would have to be the Pixi Products as I’ve never tried them but they are highly raved about! Thank you so much for this amazing opportunity! I love to win your giveaway because you have the most amazing giveaways!!!! Not kidding. I would be beyond thankful and would give most to my youngest daughter as finishing up her graduation gift that I’m just a little late on but she knows it will be worth it. (I’m not waiting to win for her gift by any means). I will add though that I enter your ga every month and thought for SURE I was following you on like to know it. A blogger recommended for me to download the app so I did and I wasn’t following a fourth of the people I thought for sure I was, including you which I found out just now. But I am now. I don’t really understand that because if I liked your post I still got your shopping items sent to my email even though I wasn’t following you. And I thought I was. Regardless, I am now. Thanks so much for your generosity and your time and thoughtfulness in picking out all of these wonderful prizes. I know one person will be astonished. I would love to win your giveaway because you have the most amazing giveaways!!!! Not kidding. I would be beyond thankful and would give most to my youngest daughter as finishing up her graduation gift that I’m just a little late on but she knows it will be worth it. (I’m not waiting to win for her gift by any means). I will add though that I enter your ga every month and thought for SURE I was following you on like to know it. A blogger recommended for me to download the app so I did and I wasn’t following a fourth of the people I thought for sure I was, including you which I found out just now. But I am now. I don’t really understand that because if I liked your post I still got your shopping items sent to my email even though I wasn’t following you. And I thought I was. Regardless, I am now. Thanks so much for your generosity and your time and thoughtfulness in picking out all of these wonderful prizes. I know one person will be astonished. I want to try all the skin care products! This is an awesome giveaway and If I won I would be so happy!! I love trying new products and then telling my friends and family about them. I would love to win because they are all great products. I would love to try them. What a great giveaway!! I’d be happy with ANY of it!! But, if I had to choose, I’m super interested in the BAMBOO CHARCOAL FACIAL SHEET MASK!! I would love to win this for the new makeup. it’s been forever since I bought any for myself. I think the last time I bought some was in 2007 for my Daughters wedding. I would consider this package a Godsend. Okay, whoever put thus one together went straight to my heart! I would love to win this to share with my daughters, it would be so much fun. As I approach the great late 30’s I’ve been taking my skin care way more seriously. I am eager to explore natural products that have healing and anti-aging properties and this giveaway has so many items that I’d love to try. Beauty and Makeup is a huge passion of mine and I’m extremely grateful for any chance to try new things. Thank You! I’m most excited to try Hair La Vie Revitalize Shampoo & Restore Conditioner. I would love to glow and sparkle after dealing with cancer and chemo. I’m really excited to try the Pixi products because I’ve heard such good things about their line but haven’t had the opportunity to try them myself before. I would love to win because all the products look great. I’d love to win the Pixi Fresh Favourites Set (with Pixi Skintreats Rose Caviar Essence, Pixi Skintreats Rose Flash Balm, and 5 Pixi by Petra MatteLast Liquid Lip glosses). I would love to win because I love trying new products! Please count me in! OMG I want to try ALL of these things! Especially the Macaron Milk & Sass for the hair and the sea salt spray! I would love to win this because these sound like amazing products. And I would like to try them all. I haven’t felt very beautiful lately. Lots of unexpected issues. Would love a pick me up surprise box! I am most excited to try the Rose Caviar Essence…first it sounds delicious and exotic, but mostly because it hydrates brightens and softens skin. My skin is very dry and dull and this would be Heaven sent! What an awesome way to introduce some of the most amazing products!! Crossing my fingers to win! Can’t say enough about all these beautiful beauty products. One spring day I hope to win so that I can share my anew with everyone! A lot of great products would especially like to try the Crabtree & Evelyn LaSource Hydra Marine Nourishing Oil. 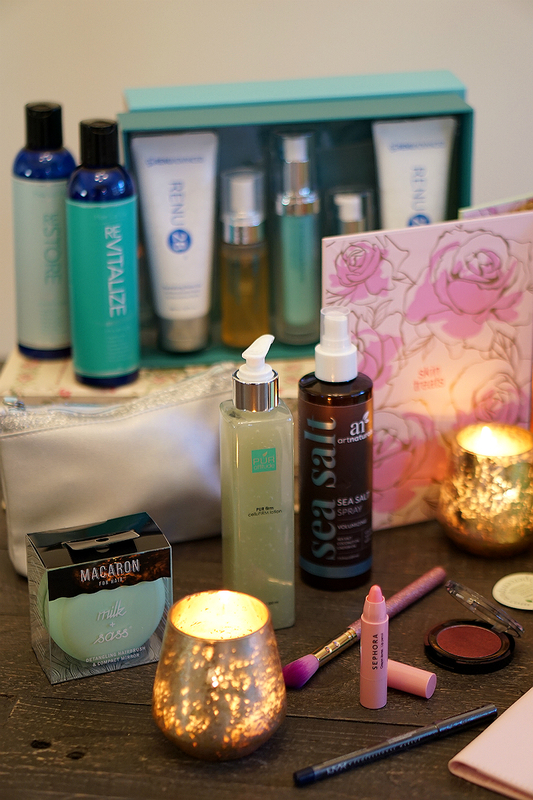 I would love to win this prize package because it’s filled with so many products I would love to try out and I would feel like i’m giving myself a little pampering. The product I would love to try most is the Pixi Skintreats Rose Caviar Essence. So many wonderful products! !….to make a wish upon a star! I like the Hard Candy Be Bold Glitter Mascara. Wow what a wonderful giveaway.. I am new to makeup n skincare as such.. So i would be thrilled if i won.. Havent even tried any of the products.. I most excited about the pixi skincare set.. But every single item seems to be amazing..
WOW, this is an ahhhhh–mazing beauty prize package!!! If I’m your lucky winner, I would be very excited in getting to try the ASEAN Renew28 skin care set. I would love to try the ASEAN Renew28 skin care set. My skin is so dry! I would love to win these prizes! I have honestly been neglecting myself for everyone else and it has taken a huge toll on me. I am trying to take better care of myself and these prizes would be great at helping me do something for myself. Thank you so very much for this opportunity to enter to win these amazing products! I would love to win because I haven’t tried these products before and I love to see how good these products work for me. Thank you for this wonderful opportunity. I love beauty and I love you. I would really like to win this for a lot of these products, but I’m really excited to try the ASEAN Renew28 skin care set. Thanks for the opportunity! I’d love to win this prize because I have gotten so lazy about makeup since retiring, and could use some new products to inspire me! All the products in this giveaway look amazing! I love Pixi! The Pixi fresh favorites sound so nice. I have really been meaning to get a Milk and Sass Macaroon brush for my long knotty hair though and would love to try one. I would love to win because it would be a chance to treat myself first!! I’m most excited to try the shampoo and conditioner! I would love to win because it has been so long since I have been able to buy myself any beauty products. I would love to try them all here!! Thank you. I’d like to win it because it’s better than paying for it. Awesome giveaway & thank you so kindly for the opportunity! Enjoy your upcoming weekend!! Soooo many wonderful things!! Thank you for the possibility to use some!! Thank you for this wonderful giveaway. I would love to try all of them. What a wonderful collection! Would love to try them all! I love to discover new products and share them with my teenaged daughter. This would be so fun for us to win! I would love to win this so I can give myself a little pampering. This is an amazing giveaway and would love to win this prize. I’m most excited for the things from Pixi! I’ve always wanted to try the brand but have never had the chance. everything sounds amazing and would definitely be used by my teenage daughter or myself. One thing I want to try is the ArtNaturals Sea Salt volumizing spray, my hair tends to get weighted down in the summer months due to humidity, and this would give it some much needed volume. this is amazing. would love to try everything!!!! So many lovely things here. I would love to win as we are trying for our rainbow baby and this would really cheer me up and on after so many months of BFFN’s ugh! Thanks for the chance. I would love to win especially the Asea Renu 28 Skincare set.They all are wonderful. my daughter in law is the makeup queen so I’ll share with her if I win.I’m most excited to try the Asea Renu28 Skincare Set. I am interested in trying the Pixi Rose line, looks amazing. “Leave a comment at the bottom of the post explaining why you’d love to win this giveaway or which of these prizes you’d be most excited to try.” I wish to preserve my exquisite beauty, and look forward to trying Macaron Milk & Sass! LOVE to try the skin care products! If I were to pick one, I’d say I’m most excited about trying the Pixi facial products!!! I would love to win this, because there are so many amazing products in this giveaway! I’d love to try all the products, but I would most like to try the Favourites Set with Pixi Skintreats Rose Caviar Essence, Pixi Skintreats Rose Flash Balm, and 5 Pixi by Petra MatteLast Liquid Lip! It all sounds so luxurious! It would be like a dream come true to win! I’d love to be able to win this great prize and share it with my daughter who’s in college. All the prizes would be nice to have. I would love to win this giveaway because I would like to share my winnings with some of the great women in my life. I would have to say I love the illuminated hight lighter the most at this point. WOW!!!! 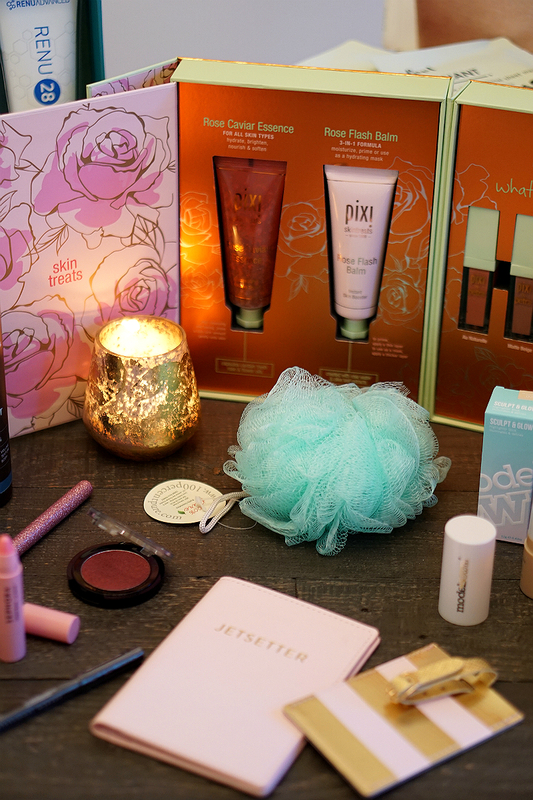 !What a prize, would really love try the Pixi Fresh Favourites Set with Pixi Skintreats Rose Caviar Essence, Pixi Skintreats Rose Flash Balm, and 5 Pixi by Petra MatteLast Liquid Lip glosses. These products sound amazing! 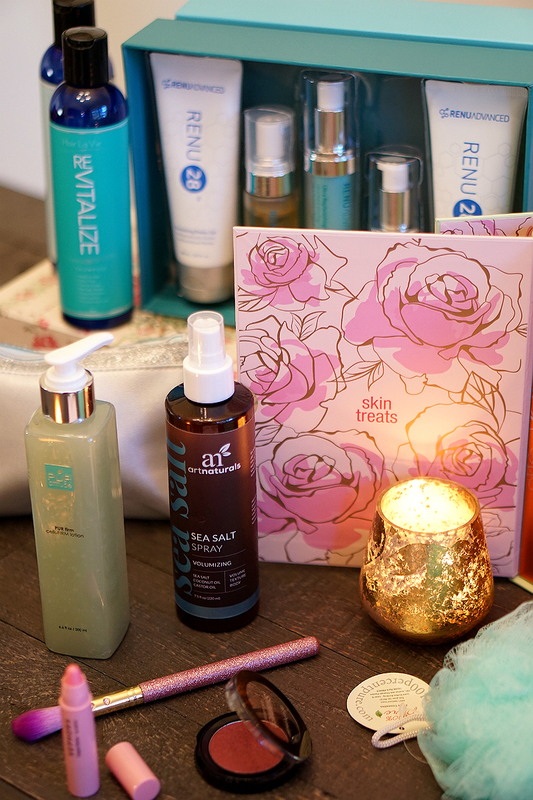 Everything looks so amazing but i am most exctied about the Asea Renu28 Skincare Set! I would like to try the charcoal sheet masks. This would be AWESOME! I would love to try any and all of these products! Thanks for the chance to win! I would love to try the bamboo charcoal face masks. Between radiation and Menopause My skin needs all the help it can get. i love all these prizes. looks great! I want to win, because winning isn’t everything, it is the only thing!! Love trying new beauty products . Thanks for the chance to win. Would really like to try asea renew28 skin care set. I would love to win that Sea Salt Spray for myself and I’d love to give that cute Macaron brush to my Mom! The sea salt spray and the pixi balms are nice. Would be a gift to mom. I just turned 50 over the summer and I need all the help I can get. I don’t tend to spoil myself because I don’t have much money left after paying the rent and bills. I am on disability following a car jacking incident in which I was shot in the chest and arm and lost the use of my right arm. I thank you so kindly for this exciting opportunity to shine! Have a great weekend everyone and good luck to all! My skin would really benefit from these beauty products. It’s been a long, harsh winter. All of these products seem wonderful and I would love to try every single one of them! Thanks so much for having this amazing contest! I’m most excited to win the Pixi Skin Treats Rose Flash Balm. Everything looks wonderful though! I would love to win all these products because I want to give it to my mum. She never has the chance to spoil herself so winning this would be perfect. The prizes are awesome. I would never be able to afford such luxuries. It would be Birthday,Christmas and more! I’m would love to try the Hair LA Vie shampoo and conditioner 🙂 Thank you for the chance to win all of these awesome products! I would love to try the Asea Renu28 Skincare set. I’d love to try the Asea Renu28 skin care products. Love to win so I can try these amazing products…..I would love especially to try the mascara. Im really excited about the skincare set. Im new to the skincare game, and I still haven’t found products that are really amazing for my skin. This sounds perfect for me. Nice prize! I am most excited about the Asea Renu28 Skincare Set! I’m most excited to try the Asea Renu28 Skincare Set. I love these prizes! I would love to win them 🙂 I don’t have many beauty products so it would be a dream come true to win these 🙂 Thank you so much for the chance to win!